Will MōVI Be A Game Changer In The Video Production World? About three years ago Vincent Laforet released Reverie which was the first proof of concept that quality films can be shot with a DSLR, the Canon 5Dmk2. The movie stirred a huge commotion on the web. The thing is that even before releasing it, Vincent knew it was going to change the game with video and dSLRs. Now Vincent is declaring what he thinks may change the game again – a hand held gyroscope power stabilizer – MōVI by Freefly Systems. 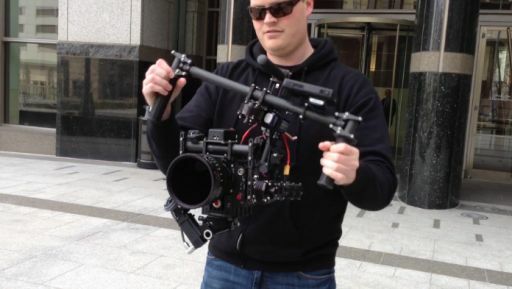 MōVI is a handheld 3-axis digital stabilized camera gimbal. This means that you shoot hand held, no tripod, no body mount, no jib, Steadicam or dolly and can still get smooth, great looking shots. If you are not sure, just watch this BTS that shows how stabilized it is even when cameraman is running full speed. Affordable – with a predicted price of under $15,000 (and a smaller unit under $7500) this can be used by most small production crews. It is not cheap, but also not that expensive when you consider the amount of gear and crew it can potentially replace. it is small, light weight. This means it can easily go on a plane or be carried into desolated locations. Short learning curve – while Steadicam can produce smooth shots, it takes years to master The MoVI is super quick to learn and use. There are currently two hand-on accounts on using the movie, the one we mentioned from Vincent Laforet and a second one from Jessie Brauning. Finally, here is the movie Vincent shot entirely with the MoVI. Quite a proof of concept.